East Harbour Motel offers accommodation in the Beach Point section of North Truro. Free private parking is available on site. In each room you will find a small refrigerator a cable TV a coffee maker and free coffee. The rooms include a private bathroom equipped with a bath and shower. 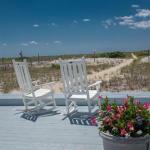 The nearest airport is Provincetown Airport 13 minutes' drive from the property.